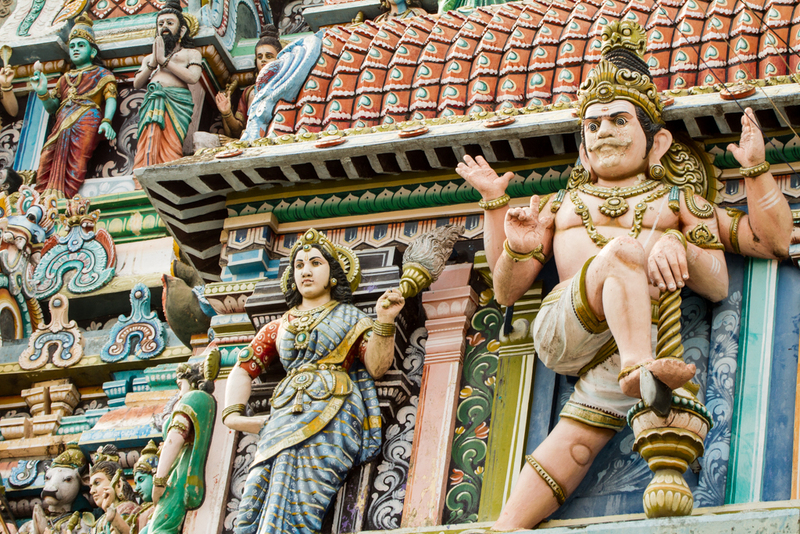 Chidambaram, in Southern India’s state of Tamil Nadu, is also known as Thillai, since the place was originally a forest of the thillai shrubs. 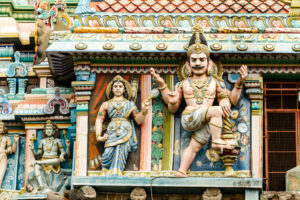 It is an important pilgrim center, a major shrine of Lord Shiva and as the famous Nataraja Temple. 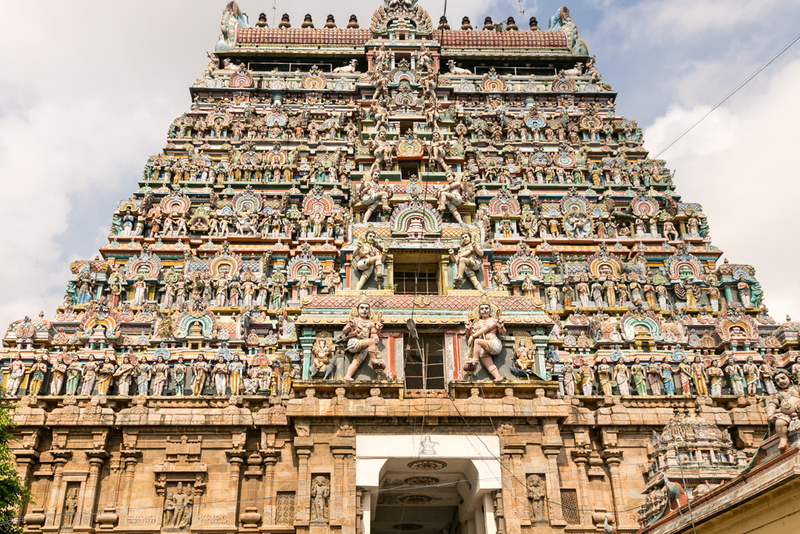 In fact, Chidambaram offers a combination of the three aspects of Shiva worship – the form Lord Nataraja (dance), the form and the formlessness (linga) and the formless omnipresence.The temple has influenced worship, architecture, sculpture and performance art for over two millennium. 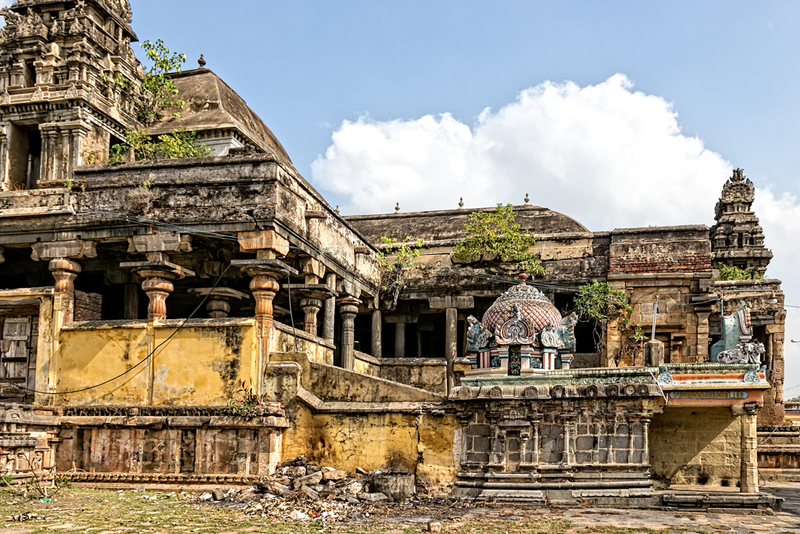 Now, that is an old temple. 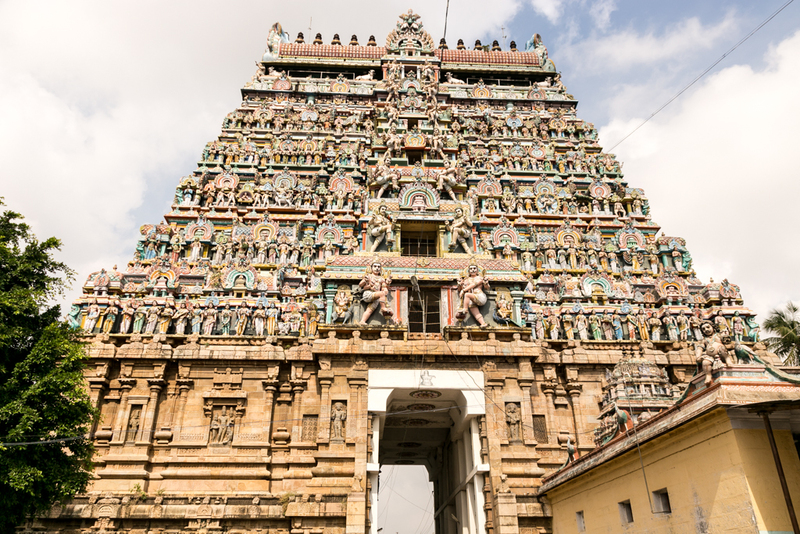 The ancient temple is located in the center of the town and covers 40 acres with four seven-story gopurams ( those huge gateways facing North, South East and West) each with around fifty stone sculptures. There are also five sabhas or courts. The presiding deity of the temple is formless, represented by air, one of the five elements of the universe. 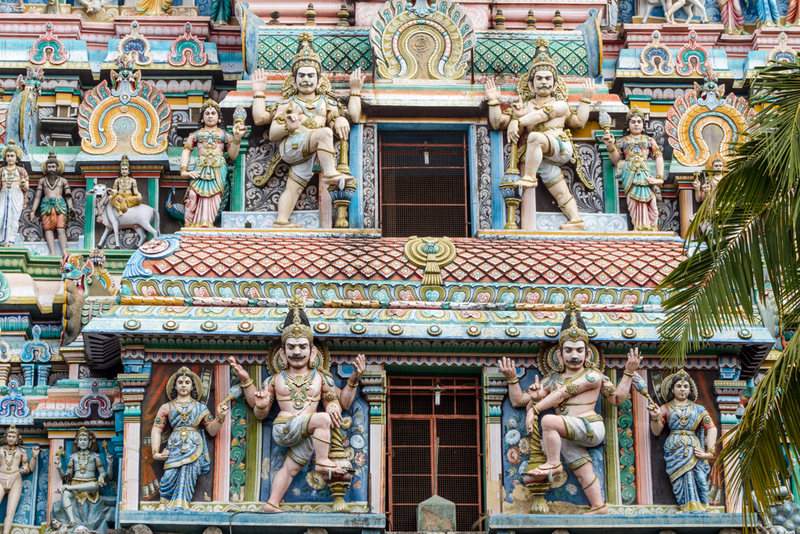 The temple is dedicated to Lord Nataraja, and is unique as it one of the rare temples where Shiva is represented by an idol rather than the customary lingam. (I’d been introduced to lingams earlier, they are black phallic looking statues.) 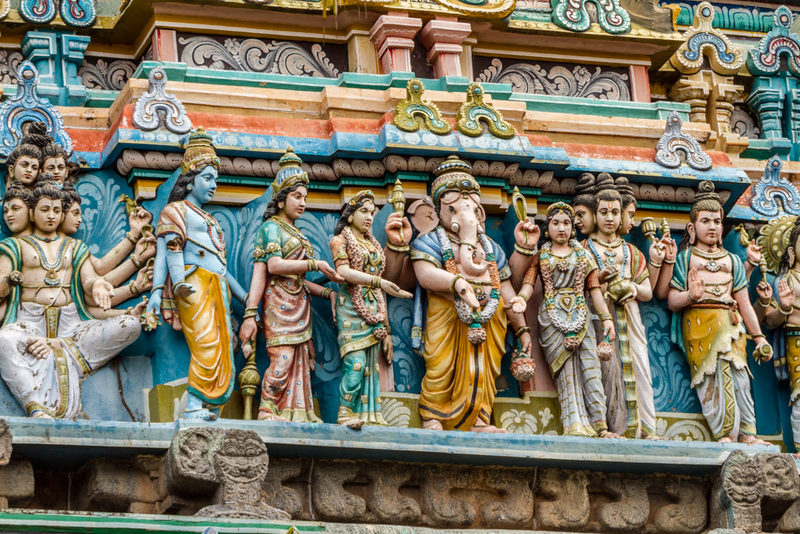 This temple also has exquisite carvings of Bharathanatya dance postures, the Classical Dance of Tamil Nadu. At Chidambaram, the dancer dominates, not the linga. 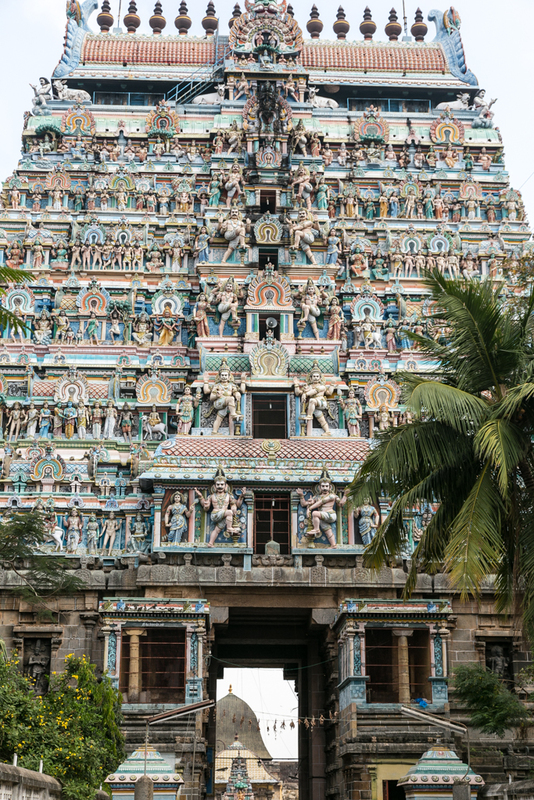 The eastern tower of the temple rises to a height of 134 feet with 108 Bharathanatyam dance poses as well as on Western tower. The Northern tower rises to a height of 140 feet and is the tallest. 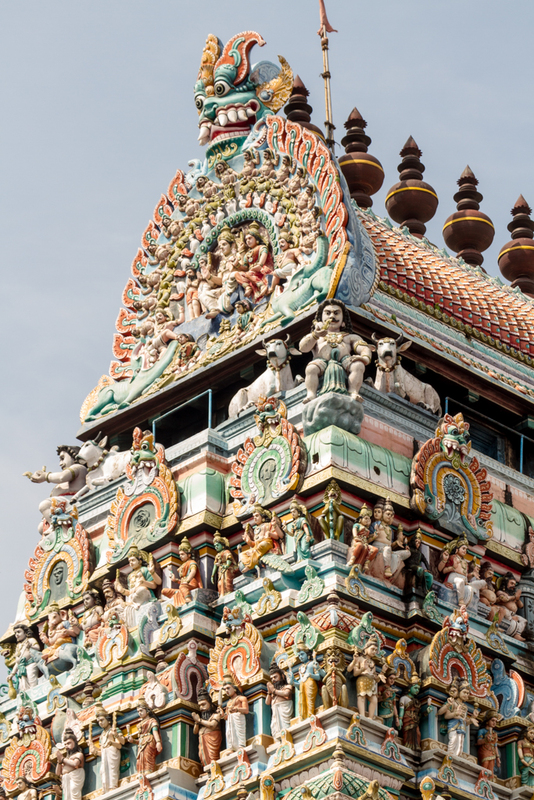 This temple is also noted for its Gold Plated roof that adorns the sanctum sanctorum, or called the kanakasabha. Non-Hindus are not allowed inside the sanctum sanctorum, so I did not see it. Although I did not know this when I visited, research indicates that the temple is located at the center point of world’s magnetic equator. * I did not feel any strong pull, but I did not sit and meditate. The temple as it stands is mainly from the 12th and 13th centuries, with later additions in similar style. 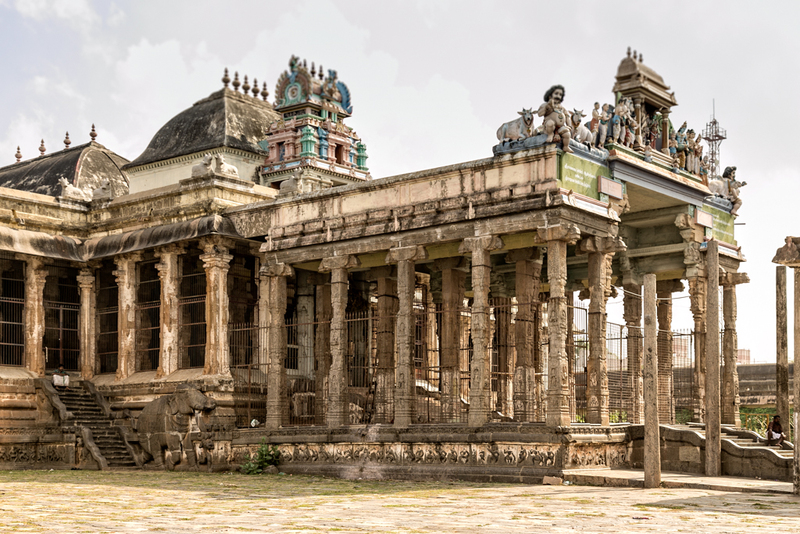 It was believed to have been originally constructed during the early Chola period (900’s AD). 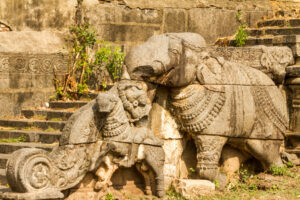 The temple was severely vandalized during invasions of South India between 1311 and 1325. 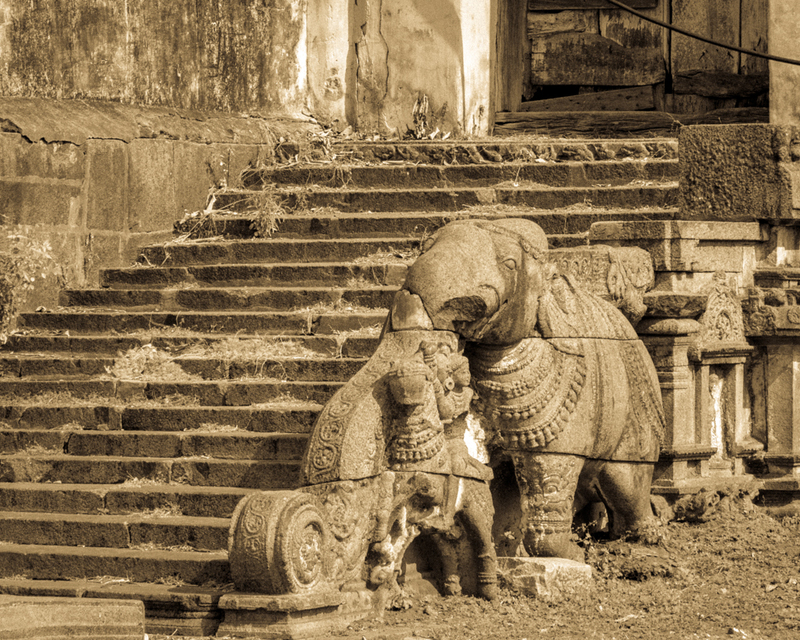 A garrison was set up within the temple and the walls were fortified during the Carnatic Wars and during the Anglo-French war between Hyder Ali and British in 1740. I think the ruins give it a mysterious aura and I rather liked the crumbling effect. The large water tank formerly used for rituals, is closed off. Please click on the individual photos to enlarge. View of tower just before entering. Close-up of dance poses on the tower. 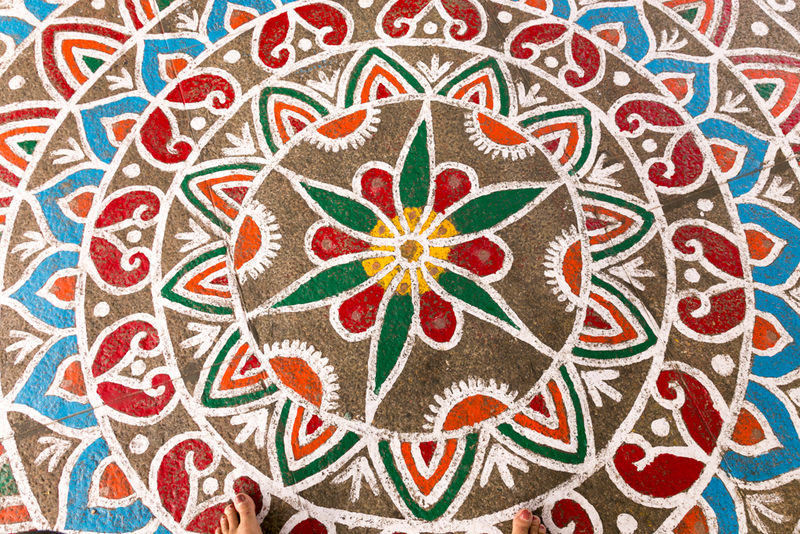 Classical Dance Poses in Tamil Nadu. 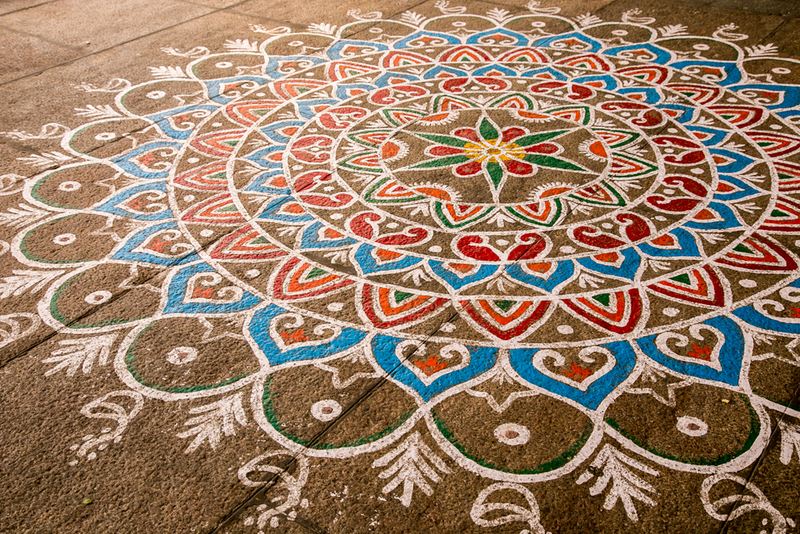 Looking down on the chalk design. 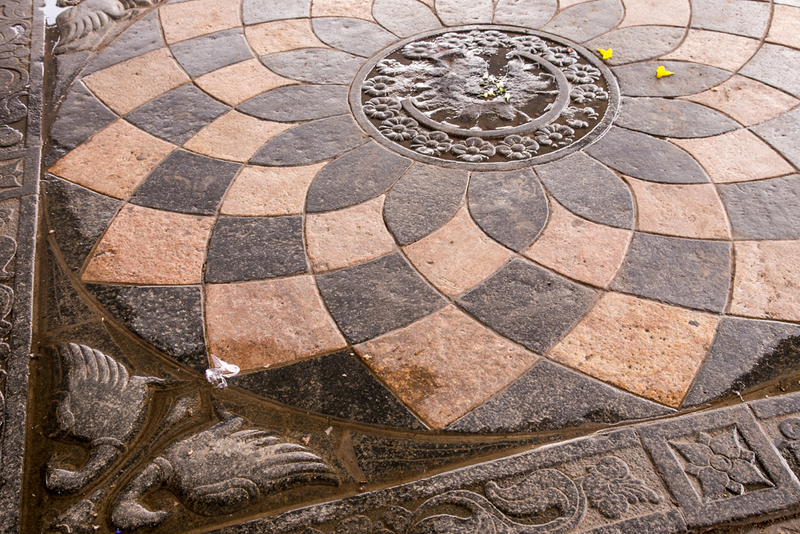 Beautiful inland stone on the temple grounds. 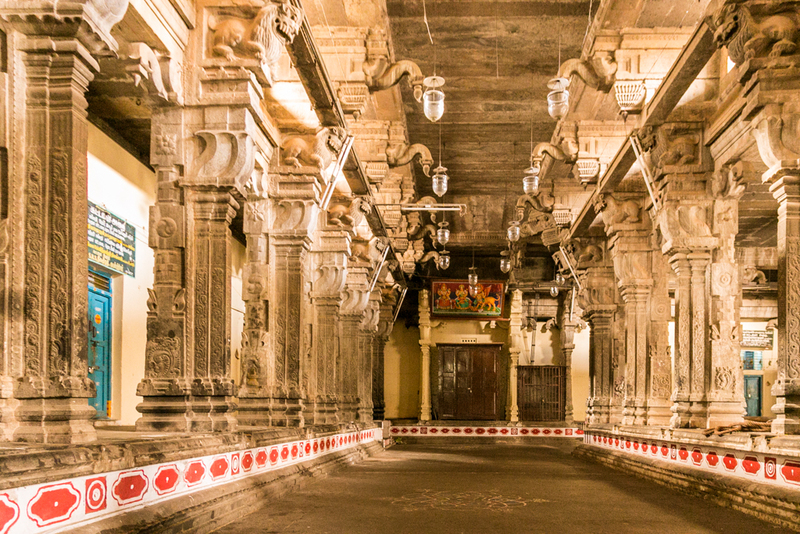 A peek inside the temple. 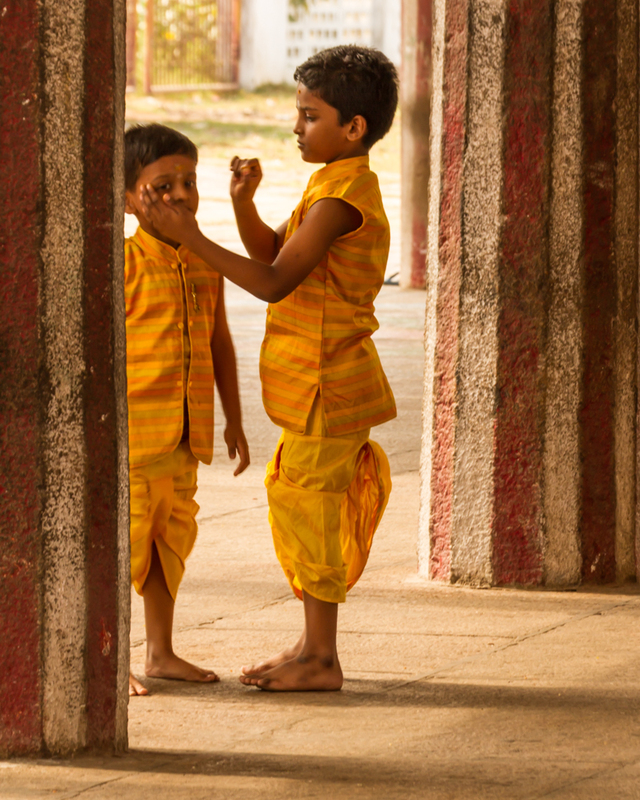 Two boys getting ready for temple rituals. 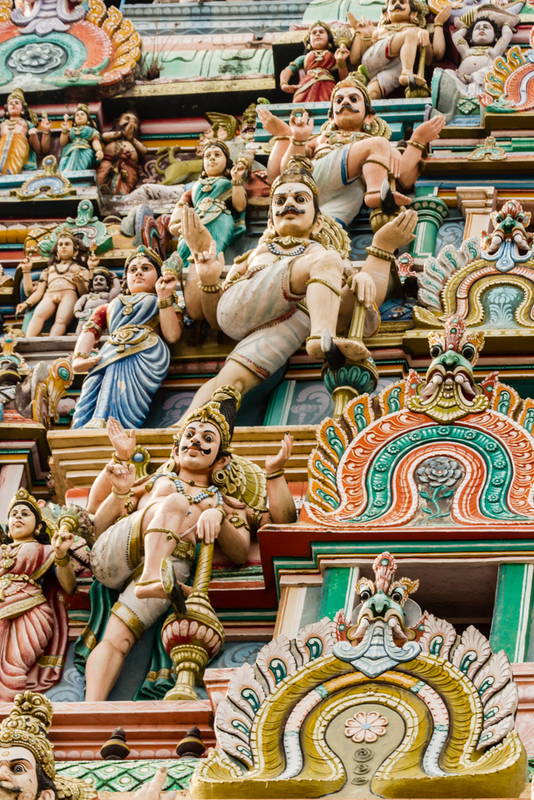 Top of the gopuram or gateway.